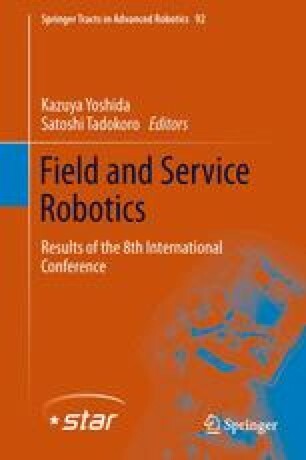 This paper presents an approach to perform frequent hand-eye calibration of an Infrared (IR) range camera mounted to the end-effector of a robot manipulator in a field environment. A set of three reflector discs arranged in a structured pattern is attached to the robot platform to provide high contrast image features with corresponding range readings for accurate calculation of the camera-to-robot base transform. Using this approach the hand-eye transform between the IR range camera and robot end-effector can be determined by considering the robot manipulator model. Experimental results show that a structured lighting-based IR range camera can be reliably hand-eye calibrated to a six DOF robot manipulator using the presented automated approach. Once calibrated, the IR range camera can be positioned with the manipulator so as to generate a high resolution geometric map of the surrounding environment suitable for performing the grit-blasting task. This work is supported by the Centre of Excellence for Autonomous Systems (CAS), the Roads and Maritime Services (RMS) and the University of Technology, Sydney.